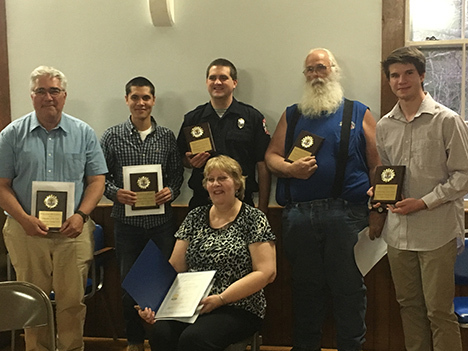 ​Left to right: William Mitchell, Educator; Luke Lalmond, Postal Worker; Holly MacCleery, Community Citizen; Kevin O’Donnell, Firefighter/EMT; Sparky representing Dominick’s Restaurant; Kyle Mitchell, Outstanding Youth. Chichester Grange held its Annual Awards Night on Wednesday, May 2nd. About 45 family members and friends were in attendance to support the honorees. Chichester Grange is pleased and proud to honor the following individuals as representatives of the services that make Chichester and the surrounding area such a great place in which to live. Kyle Mitchell, Outstanding Youth: After graduating from Chichester Central School as eighth grade president and a consistent High Honor Roll student, Kyle went on to distinguish himself at Pembroke Academy where he is well on the way to having perfect attendance for all four years. He has represented his school at the Hugh O’Brien Leadership Conference (HOBY) and been part of a Robotics Team which has gone to National Conferences in Iowa and Kentucky. Active in Boy Scouting since first grade, Kyle attained his Eagle Scout rank in June, 2017. He attended the St. Paul’s School Advanced Studies Program last summer. In the fall he will attend WPI in Worcester, MA, where he plans to study Robotics. Kevin O’Donnell, Firefighter/EMT: Kevin joined the Chichester Fire Department in 2006 as part of the Student Live-In Program. Following his graduation in 2008, he moved to Concord but continued to serve on the Chichester Fire Department. He married a Chichester girl and now lives in Chichester with his wife and baby daughter. In addition to a full-time job and his duties in the Chichester Fire Department, he volunteers on Sundays from January to June to coach Special Olympics Swimming. Last fall, Kevin and his wife Brittany were nominated and honored with the Volunteer Service Award at the Spirit of New Hampshire Awards. Kevin is both a well-trained firefighter and an excellent community citizen. Dominick’s Pizza, Pasta and Things was recognized this year for being a friendly and caring business that helps to make the town of Chichester a destination rather than a pass-through on the way to Concord or the Lakes Region. Because the restaurant is a family business that was open on the night of the awards program, “The Mayor of Dominick’s” was volunteered to accept the award. Sparky, a regular customer for several years, was a good sport about receiving the plaque to bring back to the restaurant. William Mitchell, Educator: This year it was the turn of Pittsfield Middle High School to nominate an Educator of the Year. William Mitchell has been a juried print maker in the League of New Hampshire Craftsmen since 1991 and is a listed artist in Who’s Who in America. He teaches Art at PMHS and has supported the establishment of after school programs such as the Art Club and the literary and art publication Loose Leaf Magazine. Mr. Mitchell has facilitated Learning Studios with students and colleagues, including Empty Bowls, which developed and designed ceramic soup bowls, planned soup recipes, and held a fundraiser to support the Pittsfield Food Pantry. Most recently, his Learning Studio Panther Shirts, Print, and Design has designed and printed t-shirts for school organizations. Additionally, Mr. Mitchell has served as a chaperone for the Ski and Snowboard Club. Holly MacCleery, Grange Community Citizen: Holly has lived in Chichester all her life, first with her parents Lucille and Ernest Randall and then with Steve MacCleery, her husband of 41 years. As the granddaughter of Shirley Marden, she was involved with Chichester’s Old Home Day during her growing-up years. As an adult she has served her town by being Secretary to the Selectmen & Planning Board for four years and Secretary to the Board of Adjustment for thirty-three years. That is a lot of meetings to attend and minutes to write, but Holly has thoroughly enjoyed serving the town and its citizens. It was with a heavy heart that she had to resign as Secretary to the Board of Adjustment due to recent health issues. Thankfully, she is still able to hold the position of School District Treasurer and continue to serve her community in that capacity. Luke Lalmond, Postal Worker: Luke started working for the US Postal Service in 2015 in Salem, NH. as a Postal Service Employee. He became a Part Time Flexible Clerk in Pittsfield, NH, in 2017. Luke is a very dependable employee and will come in to work when needed even if not scheduled in advance. In addition to his clerical duties, he helps out with the custodial work in the Pittsfield office. He also works in other neighboring Post Offices. Everyone that works with Luke really likes him. The customers ask for him when he is not scheduled. Luke is young, but he works hard and shows great promise. If he stays with the Postal Service, he’s going to make a great Post Master someday.